Performers include: Dennis Quaid, Michael Chiklis, Carrie-Anne Moss, Jason O’Mara, and Taylor Handley. 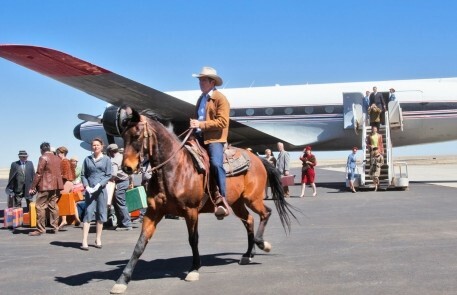 This TV series is based on the true story of former Las Vegas Sheriff Ralph Lamb (Dennis Quaid), a fourth-generation rancher tasked with bringing order to Las Vegas in the 1960s. It’s a gambling and entertainment mecca that’s emerging from the tumbleweeds. Ralph Lamb wants to be left in peace to run his ranch, but Las Vegas is now swelling with outsiders and corruption which are intruding on his simple life. Recalling Lamb’s command as a military police officer during World War II, the Mayor appeals to his sense of duty to look into a murder of a casino worker. Lamb has two deputies who help him keep law and order. His diplomatic and even-keeled brother is Deputy Jack Lamb (Jason O’Mara). Deputy Dixon Lamb (Taylor Handley) is his charming but impulsive son. The ambitious Assistant District Attorney, Katherine O’Connell (Carrie-Anne Moss), grew up on the ranch next to the Lambs and also lends a hand in preserving justice. After Porter Gainsley’s bombing of the Tumbleweed and attempt on Katherine’s life, Lamb and Savino decide to team up to take out their common adversary once and for all. To prove his commitment to the task, Lamb hands over the tapes with the recordings from the bug in Savino’s phone, and then the mobster and former sheriff get to planning their assault on Gainsley. Since the ranching mogul is too heavily protected at his home, they decide to target him at a livestock auction, but that plan goes awry when Dixon shows up and holds Gainsley at gunpoint. A firefight breaks out and Lamb is forced to save his son and flee, giving Gainsley time to regroup and amass more artillery for the coming war. When Jack is ousted as interim Sheriff by more of Gainsley’s men, he and Dixon join forces with Lamb and Savino, and together they craft a plan that involves using Jones the hitman to put Gainsley in a corner. Jones plays his part well and leads Gainsley and his thugs into a trap, where Lamb gives him his freedom as a reward. After an intense firefight, Lamb gets the drop on Gainsley and decides to arrest him instead of killing him, setting the proper example for his son and staying true to his morals. In the end, Lamb gets his Sheriff job back, putting him at odds with Savino and his plans for growth in Vegas yet again. Meanwhile, Jack plans to propose to Mia, but his plans are derailed when she breaks up with him after finding out about the bug he planted in Savino’s phone. Tommy pursues Mia even harder, and the two wind up spending the night together. After Gainsley is taken into custody, Jack goes to Mia’s place to fight for her, but is crushed when he discovers Tommy there with her — in nothing but a bath robe. What do you think? Do you like the Vegas TV series? Do you think it should have been cancelled or renewed for a second season? Vegas: CBS Trims Episode Order, Will There Be More? 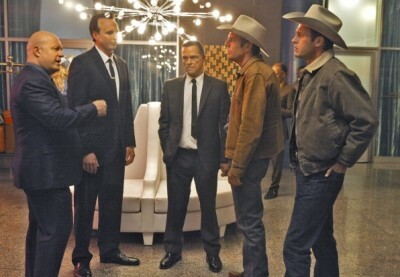 Vegas: New CBS Drama; Is It Worth Watching? Vegas: Cancelled Quickly or a Big Hit? Netflix needs to renew this show! Loved it! I loved the show. There are so many TV shows on now that are so much the same that VEGAS was a much needed change. Plus it is about a city that has so many stories to tell. Love the shows about the 50’s,60’s and 70’s So wish it was back on the air. What a great show ever episode had it all!!!!!!!!!!! !